Visit my New Play Exchange Profile which hosts the latest drafts of my full-length plays. Stephanie Erb is nonimated for Best Actrees for her role of Shirley Towers. 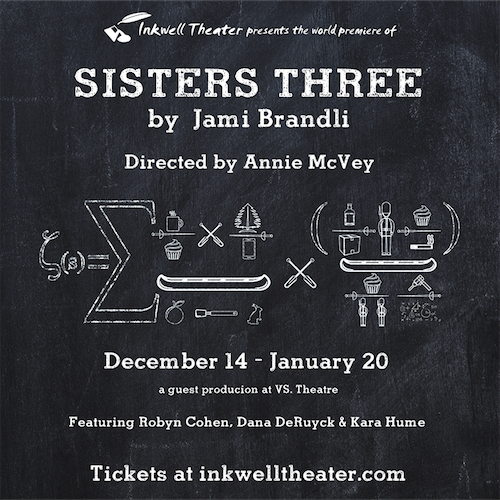 Sister Three receives its world premiere with The Inkwell Theater; Dec 13th, 2018 to January 20, 2019. Opening night December 14th. Get your tickets here! And check out the lovely preview in the Los Angeles Times! BLISS (or Emily Post is Dead!) is a LA TIMES Critic's Choice and Ovation Recommended! BLISS (or Emily Post is Dead!) is a LA TIMES Critic's Choice and Ovation Recommended! Now extended to December 10th! The LA Times gives BLISS some love! 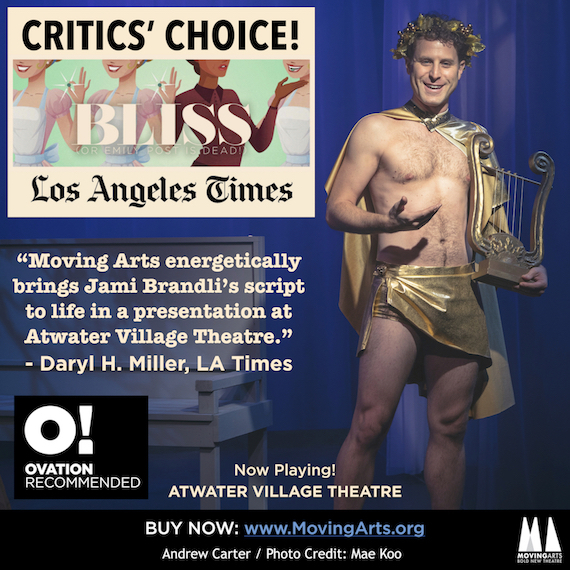 "“BLISS” ran in San Diego to rave reviews — for obvious reasons. 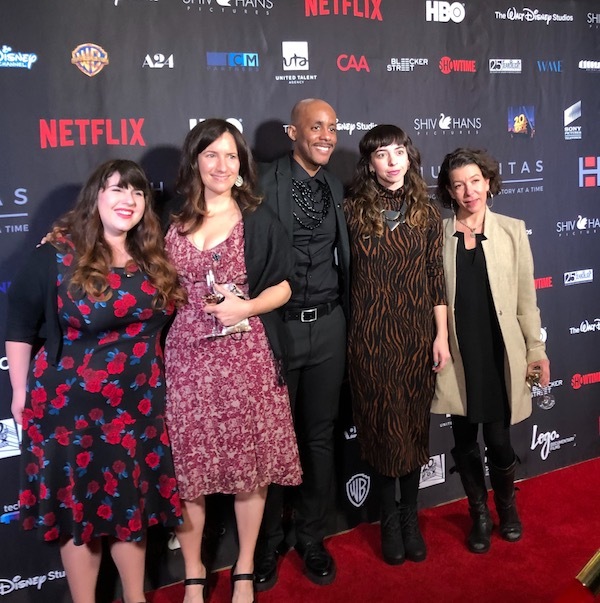 Recently named one of the Humanitas Prize PLAY LA Playwrights for 2018-19, Brandli is very much a talent to be followed, and “Bliss,” the first in her planned four-play “reclaimed Greek myth cycle,” is a gem that warrants wider viewing. Although her female characters seem initially comic, Brandli does not blunt their tragic proportions, and the 1960 setting is an inspired choice that emphasizes their limited options and restrictions — the same issues confronted by their Greek predecessors hundreds of years ago. Brandli disguises her political pungency with comedy — the perfect medium to massage an important message across the footlights." BLISS (or Emily Post is Dead!) ends its joint world premiere with Moving Arts in Los Angeles! BLISS (or Emily Post is Dead!) ends its 2018 joint-world premiere with Moving Arts in Los Angeles; November 1st to December 2nd, 2018. Get your tickets here! Read the press release here! I'm honored to be one of the 2018-2019 Humanitas PLAY LA playwrights! And I'm looking forward to writing my next play under the auspicies of the Humanitas organization. -"Brandli’s clever script deftly paints the three tragic figures with enough comic playfulness that we are invited to laugh as they go through the reiterated motions of their own damnation: a wonderful narrative trick that works because of excellent writing..."
"BLISS (OR EMILY POST IS DEAD!) is uncomfortable, humorous, and incisive in all the right ways..."
-"BLISS ( or Emily Post is Dead! ) is an intelligent, fierce exploration of second-wave feminism interspersed with ancient legends...."
-"Jami Brandli’s clever script for BLISS (or Emily Post Is Dead!) maps the path from tragic Greek heroines to 1960s New Jersey housewives....The play is funny and poignant and addresses relevant issues of racism, sexism and second-wave feminism." BLISS (or Emily Post is Dead!) continues its joint-world premiere with Promethean Theatre in Chicago! -BLISS (or Emily Post is Dead!) continues its joint-world premiere with Promethean Theatre in Chicago; July 21st to August 25th, 2018. Get your tickets here! O: A Rhapsody in Divorce--the latest installment in my play cycle of reclaiming of Greek Myths--receives a reading with the Playwrights Union's First Peek Reading Series; June 3rd, 2018. 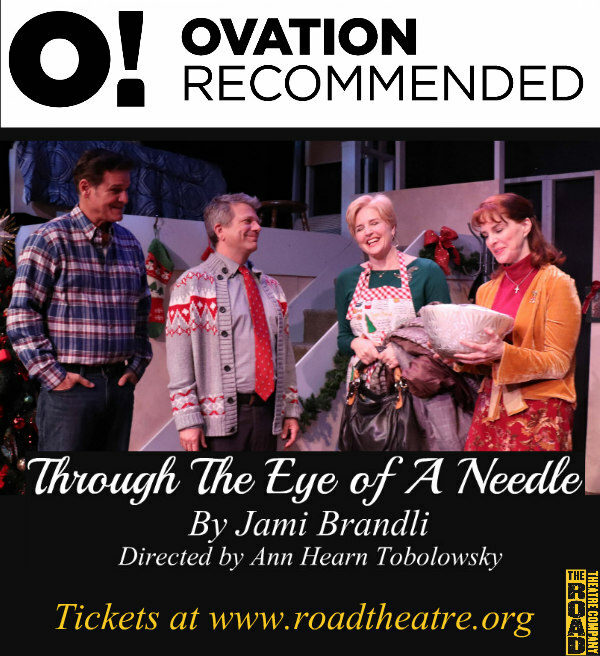 The reviews for The Road's production of Through the Eye of a Needle are in...and it's OVATION RECOMMENDED, too! 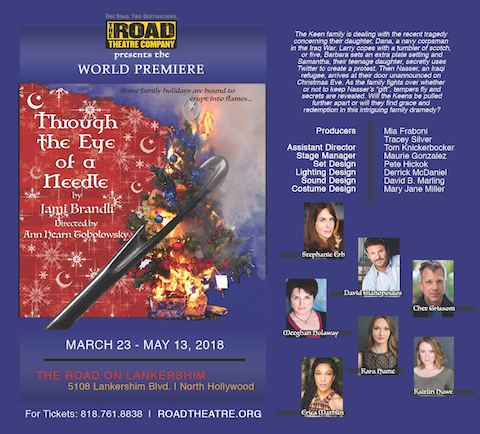 Through the Eye of a Needle receives world premiere with The Road Theatre Company; March 17th to May 13th, 2018. Opening night. March 23rd. Get your tickets here! 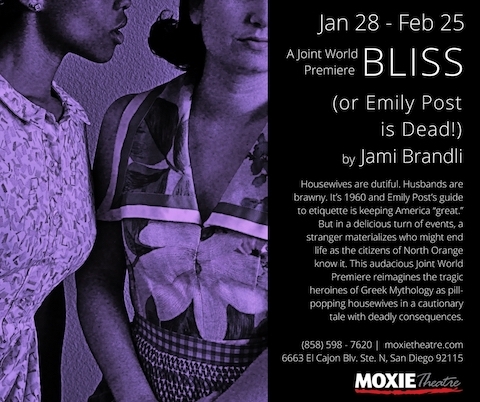 Moxie Theatre kicks off joint-world premiere of BLISS (or Emily Post is Dead! ); January 28 to February 25, 2018. Click here for tickets! 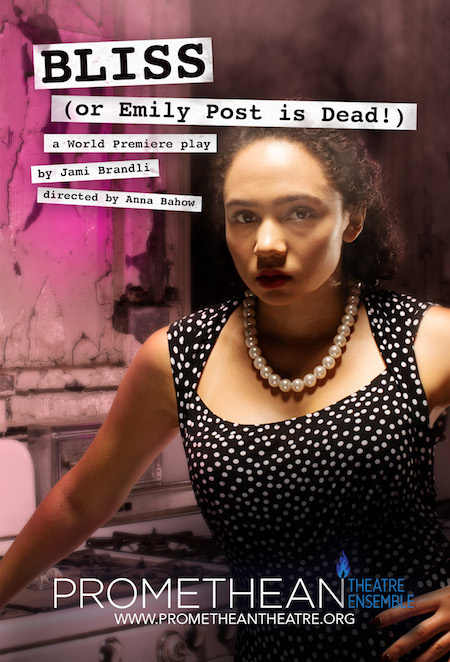 Renaissance Theaterworks is thrilled to present our Second Annual Groundworks production, BLISS (or Emily Post is Dead! ), December 10-12, 2017. For more info and tickets, click here! Through the Eye of a Needle receives a workshop as part of the Launch Pad Series at UC Santa Barbara. The public reading is free; Thursday, July 20th at 7:30pm, 2017. BLISS (or Emily Post is Dead!) receives production at Miami University, February 22 to 26th, 2017. Click here for more details! I'm thrilled to one of the playwrights-in-residency at Serenbe Playhouse for their New Territories Playwriting Residency; January 15 to January 28, 2017! For more info, click HERE. ¡SOLDADERA! has been named a Finalist for the 2017 Source Festival! 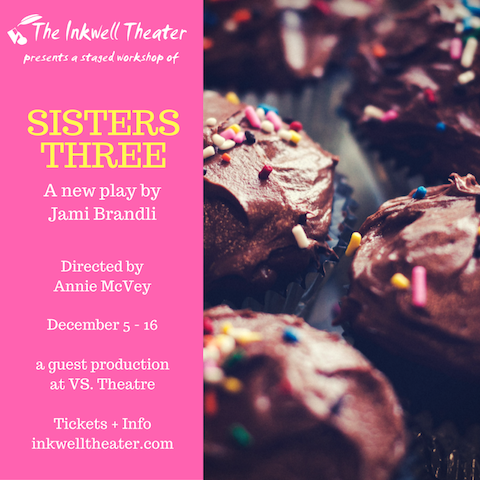 Sisters Three receives a workshop production with The Inkwell Theater at VS Theater in Los Angeles. The workshop production runs from December 5th to December 16th, 2016! Ticket info HERE. 2016 PEN Drama Award Finalist! I'm thrilled and honored to announce that Technicolor Life is a Finalist for the 2016 PEN Literary Award for Drama! I'm SUPER excited that my brand new play A Merry Little Christmas, a working-class dramedy about a New Jersey family, is part of The Road Theatre Company's Summer Playwrights Festival 7! More details here. And for more info about A Merry Little Christmas and my other plays, please check out my New Play Exchange profile. A Merry Little Christmas is a working class family dramedy about the Keen family dealing with the death of their daughter, Dana, a navy corpsman who recently died in the Iraq War. Larry copes with a tumbler of scotch or five, Barbara stubbornly sets an extra plate setting, while their straight-edge teenage daughter, Samantha, secretly uses Twitter to create a protest on the George Washington Bridge. Much to Larry’s annoyance, the self-righteous Pastor Bill Towers and his fragile wife, Shirley, invite themselves over for Christmas Eve dinner, and then Nasser, an Iraqi refugee, arrives at their door unannounced. They quickly learn he was Dana’s trusted military interpreter and that Dana has given Nasser as a “Christmas gift.” As they fight over to keep Nasser or not, tempers fly and secrets are revealed. Will the Keens be pulled further apart or will they find grace and redemption in this unexpected gift? For tickets, info can be found here! "Epic Love" will be produced as part of The Boston Theater Marathon XVIII, Sunday, May 8th, 2016. I'm beyond thrilled to be joining New Dramatists as a guest playwright for their Composer-Librettist Studio from February 17th to March 4th, 2016. All info is below. Join us on March 4th from 1pm to 6pm for an open session featuring 25 new musical pieces generated over the course of the Composer-Librettist Studio. 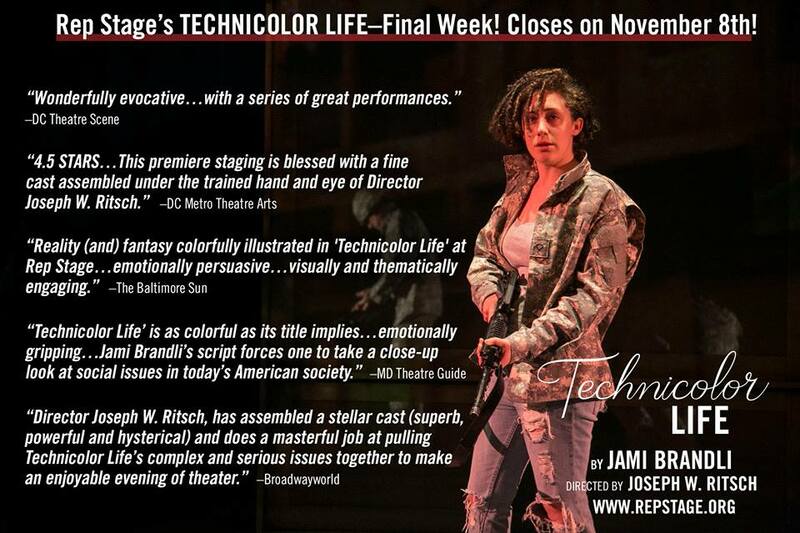 Technicolor Life heads into its final week! REP Stage is proud to present the world premiere of Technicolor Life as part of the Women's Voices Theater Festival. Directed by Joseph Ritsch. Runs October 21-November 8, 2015. Press release here. 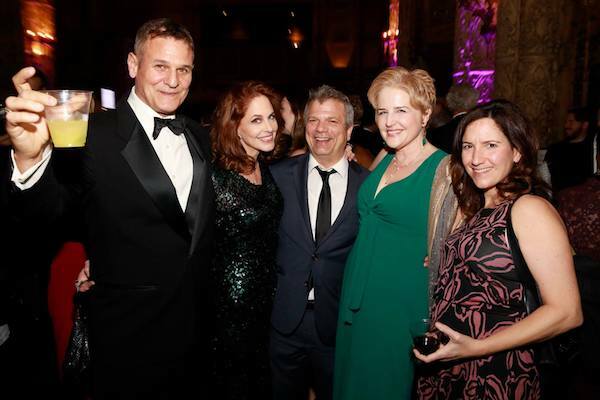 Read my blog post about the Women's Voices Theater Festival Gala here! Read my interview with HowlRound here! Read my interview with DC Theatre Scene here! BLISS (or Emily Post is Dead!) will receive a reading at The Matrix Theater as part of The Open Fist Theater Company's First Look Festival; Los Angeles. More info here. "Epic Love" will be produced as part of Moving Arts' The Car Plays, presented by LaJolla Playhouse in their 2015 Without Walls Festival; LaJolla, CA. Info for tickets here. M-Theory will receive two workshop readings with The Inkwell Theater Development LAB at VS Theater in Los Angeles. More info here. Technicolor Life will receive a reading at Williams Street REP in Crystal Lake, IL; Michele Vazquez directs. More info here. Sisters Three will receive a reading at REP Stage as part of their monthly reading series; Columbia, MD. More info here. BLISS (or Emily Post is Dead!) will be read at HERE Arts Center on Tuesday, December 9th @ 4pm. CulturalDC is pleased to announce that 25 Full-Length Plays have been selected as finalists for Source Festival 2015. Three Full-Length Plays will be selected from the 25 finalists to be produced at the Source Festival from June 5-28, 2015. Sisters Three is one of those finalists. More info here. My short play, Semi-Circle of Pain, will be produced as part of Chalk Rep's site specific FLASH Festival, Oct 9, 10 and 11 @8pm. All 15 plays will be produced at 8th & Hope, a new hi-rise in Downtown LA. This will is definitely sell out, so buy your tickets here! Additional info here. Directed by Nataki Garrett. Sisters Three will be read as part of Moving Arts' MADlab Reading Series on Saturday, August 23rd @6pm; located at The Lillian Theatre (1076 Lillian Way, LA, 90038). More info here about the play and the reading series here. The Bronte sisters, modern day. Due to the death of their brother, Charlotte has dropped out of society and joined a commune on Gondol Island. So Emily and Anne build a canoe to rescue her. In this off-center dramedy about family, social media, and fame, individual secrets and desires are revealed which could tear the sisters apart. BLISS (or Emily Post is Dead!) has been named as one of the 46 most recommended plays written by female playwrights known as THE LIST organized by The Kilroys. I'm both honored and humbled to be a part of such an amazing list of femal playwrights. More info about the 46 plays here. More info about the 300 plays nominated here. Join the conversation about gender parity in American Theater (and the arts in general) by following The Kilroys on Twitter and following/additing to the discussion #parityraid. BLISS (or Emily Post is Dead!) will be read as part of The Antaeus Company's ClassicsFest on Sunday, July 13th and Monday, July 14th @7pm. Learn more about The Antaeus Company here! 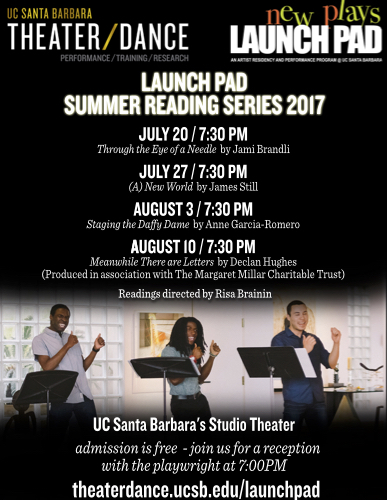 SUMMER LAUNCH PAD: New Plays in Process invites three professional playwrights to join the UC Santa Barbara community as artists in residence in a summer course. ¡SOLDADERA! is one of the three! It will receive a workshop and reading July 3rd @7pm. Risa Brainin directs. More info here. Sisters Three will be read as part of the Playwrights Union FIRST PEEK Reading Series on Sunday, May 18th at 5:30pm at Monk Space (4414 West 2nd Street, Los Angeles, California 90004). Seven other plays written by LA playwrights will be read as well on May 17th and 18th, so check it out! The Brontë sisters, modern day. Due to their brother's death, Charlotte has dropped out of society to join a commune on Gondal Island. So Emily and Anne build a canoe to rescue her. In this off-center dramedy about family, social media, and fame, individual secrets and desires are revealed which could tear the sisters apart. Aurora Theatre Company announces the four plays chosen as prize winners by a committee of local directors for the ninth annual Global Age Project (GAP), the company’s new works initiative that promotes the creation of forward-looking theater: #therevolution by Kristoffer Diaz; Technicolor Life by Jami Brandli; Sagittarius Ponderosa by MJ Kaufman; and Welcome Home by Stephen Brown. The selected GAP plays will be presented as staged readings in a four-week festival at the Aurora Theatre, Mondays, February 10-March 3, 7:30pm. Technicolor Life will receive its reading on Monday, February 17th. Visit Aurora Theater Company's website for more details. Marissa Wolf directs. CulturalDC is pleased to announce that 25 Full-Length Plays have been selected as finalists for Source Festival 2014. Three Full-Length Plays will be selected from the 25 finalists to be produced at the Source Festival from June 6-29, 2014. BLISS (or Emily Post is Dead) is one of those finalists. To read the full press release, click here. ¡SOLDADERA! will be read as part of the Playwrights Union Reading Series on Sunday, May 19th at 6pm at Son of Semele Theater. Six other plays written by LA playwrights will be read as well, so check it out! The Mexican Revolution. A teenage girl with face blindness searches for her mother who left to become a revolutionary soldadera (female solider). As she uncovers secrets in the soliders camp, she discovers her own courage. I'm a Finalist for the 2013 Playwrights' Center Core Writer Fellowship for my play BLISS (or Emily Post is Dead!). S.O.E. (formerly The Sinker) receives its World Premiere and it just got extended--YAY! Darin Anthony directs and S.O.E. will feature Jessica Hanna, Michael Kass and Diana Wyenn. And Cece Tio is co-producer. Purchase tickets here! Check out the Press Release here! Want to read my First Person article in LA STAGE TIMES? Click here. LA WEEKLY REVIEW--S.O.E. gets a GO! My short play, Back Stock, will be produced as part of the 2013 Source Festival line-up this June in Washington DC. Maureen Monterubio directs. The full schedule of performances will be announced in March. Yay! The opening scene of my new play, ¡SOLDADERA!, will be streamed live on #NEWPLAY TV, on Thursday, January 31st, at 7:30pm EST/4:30 PST. ¡SOLDADERA! will be presented by Generous Company in Baltimore, Maryland as part of Gumbo, a six-night festival of new works from theater, visual arts, and music blurring the lines between art and neurobiology. Technicolor Life receives a reading at New York Theatre Workshop on Monday, September 10th at 3pm as part of their Mondays @3 reading series. BLISS (or Emily Post is Dead!) receives a staged reading as part of the Theatricum Botanicum Seedlings Spring Playreadings in Topanga Canyon, CA; Sunday, June 10th at 11am. BLISS (or Emily Post is Dead!) is selected as MainStage Reading for the 2012 Great Plains Theatre Conference in Omaha, NE; May 26 to June 2. Kip Fagan directs. Reading takes place on Saturday, June 2nd. Looking forward to being a MainStage Playwright! Technicolor Life receives staged reading at ROCA; West Nyack, NY. Cast includes Jordan Baker and Kevin Kilner. Pam Berlin directs.